Sheffield Lake, Ohio shares historical background with neighboring communities of Avon, Avon Lake, Sheffield Village and North Ridgeville—all having origins back to the early 1800s and all experiencing growth in the post-World War II housing boom. In addition, Sheffield Lake has a Lake Erie shoreline with picturesque views. 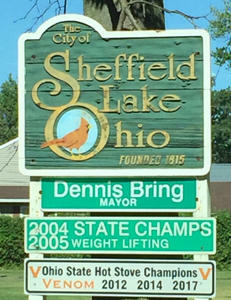 Sheffield Lake officially became a city in 1960 and as of the 2010 Census had about 9,000 residents. There are about 4,000 housing units in the city, and with the low real estate taxes in Lorain County, Sheffield Lake is experiencing growth in home remodel projects, especially in areas such as basement remodeling. 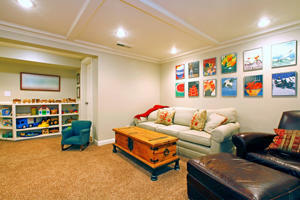 The possibilities for basement remodeling in Sheffield Lake are only as limited as the imagination. There’s a good chance the basement has become the perfect spot to store unused furniture and boxes. If that’s the case, the first step is to clear out some space. Then you’ll be able to visualize how your remodeling project will make use of the square footage. Some of the most popular ideas include a game room or play space for children, an exercise room, a wet bar for family and friends and a home theater. Other ideas include an office, a workshop, a guest bedroom and a bathroom. Depending on how your house was designed, you may have a full or partial basement. You’ll have to work around the furnace and laundry areas, since more than likely they can’t be moved. However, partitioning off these areas in themselves gives a new look and feel to the space. One of the initial concerns is the basement’s integrity. Is it dry, or are there leaks where water seeps in? Also, has the basement settled, leaving cracks in the foundation? Such concerns would need to be resolved before remodeling the basement. A structural analysis can determine where repairs are needed and recommend steps to take. If neither of those issues affects your project, it’s time to plan a budget. Since basements usually offer a large, open space, remodeling may involve the expense of dividing that area into your dream man cave or woman cave. In the Sheffield Lake area, basement remodeling ranges from a low of $7,500 to a high of $35,000, according to HomeAdvisor, a service which tracks home repair prices and offers recommendations. The average is $18,000. The next step in planning basement remodeling in Sheffield Lake is to determine what your home is missing and how the basement could fill that need. If the kids need more room for their toys and open space to occupy themselves, a play area is a solution. A top priority for families with young children is an area designed so adults can keep an eye on the little ones. For example arranging furniture lets adults watch TV while monitoring the children as well. Cabinets and shelves are a must so toys and games can be stored. Carpet tile squares offer an option to wall-to-wall carpeting, and can be replaced easily if they are damaged. They are also available in bright colors or patterns that spell “fun” for kids and resist the problems moisture may cause in damp basements. 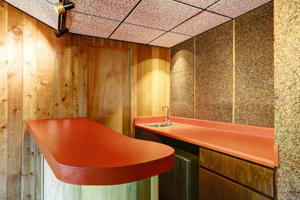 A wet bar nook with red counters and wood plank wall is an attractive addition to your basement. A basement bar is a way to build a hangout for friends to watch the game without the crowds—and it will add value to your home when the time comes to relocate. If water and drain lines are available in your basement, it makes it much easier and less expensive to construct a wet bar. Electrical lines can be installed for refrigerator or wine cooler. Depending on your space and the position of ceiling supports, your bar can be an intimate size for two stools on up. 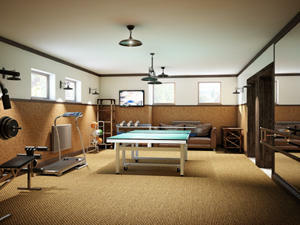 Why not add a home gym in the basement with fitness equipment and table tennis? Another popular remodeling project is a basement exercise room that offers motivation to work out without traveling to a gym. Initially, you should decide if you favor a weight room or cardio space where you can place a treadmill, depending on the space. Overhead lighting, mirrors and rubber padded flooring are all amenities that enhance the exercise atmosphere. For those who favor chilling out in front of the TV, a home theater is a great option, especially if you can locate it away from light sources and noise, such as from a furnace/air conditioner. If you have enough room for recliners and armchairs, your home theater will have more of movie-theater atmosphere. A large TV or projector is a must, as is a sound system. Consider electrical connections and structural features when you design the ultimate home theater, as well as internet access for streaming movies. Whatever your choice for a basement remodeling, choose a construction partner you can trust to listen to your ideas, complete the work on time and deliver a completed project that exceeds your satisfaction. Don’t look any further—that’s Sciarappa Construction. We’ll make sure you have a complete understanding of the scope of work, the schedule and the total cost.